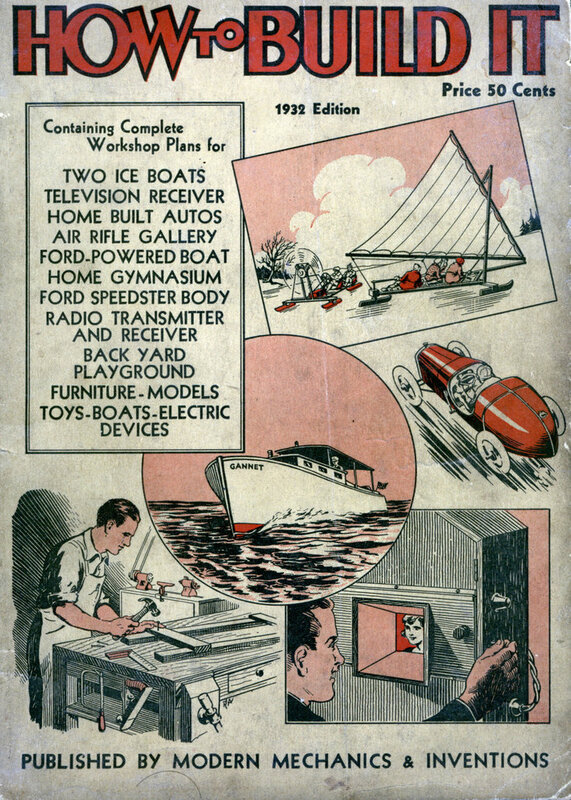 The Amateur Electrician Department offers this month plans for building an electric motor of extremely unique design. Powered by two solenoid magnets, it will easily operate small mechanical toys. FROM a few odds and ends and a quantity of magnet wire you can construct an interesting little two-cylinder electric engine that resembles a steam engine in its actions. Electrical energy is transformed into mechanical motion by two solenoid magnets acting on iron pistons connected to a suitable crank shaft. First, obtain two pieces of copper, brass or aluminum tubing about one and one fourth inches long and one fourth to three eighths inside diameter. Cardboard tubing can be used as specified in the accompanying photo, but metal is more satisfactory. Make a spool by slipping fiber or cardboard washers 1-1/4 inch in diameter over the ends of the tubing, and wrapping a few turns of adhesive tape around the center portion. It is best to glue washers to the tape, as this gives rigidity to the magnet. Then wind each spool with No. 22 cotton covered copper magnet wire, filling the spool space almost completely. This will produce a solenoid that will operate from a storage battery or bell transformer. 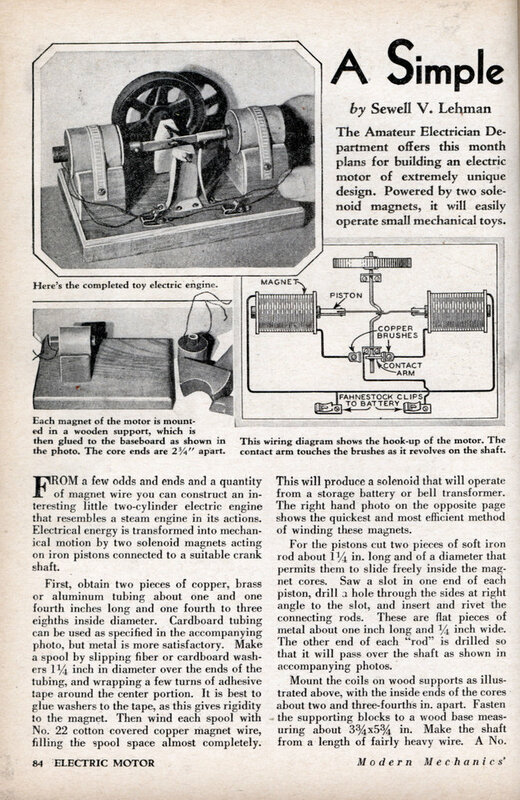 The right hand photo on the opposite page shows the quickest and most efficient method of winding these magnets. For the pistons cut two pieces of soft iron rod about 1-1/4 in. long and of a diameter that permits them to slide freely inside the magnet cores. Saw a slot in one end of each piston, drill a hole through the sides at right angle to the slot, and insert and rivet the connecting rods. These are flat pieces of metal about one inch long and 1/4 inch wide. The other end of each “rod” is drilled so that it will pass over the shaft as shown in accompanying photos. Mount the coils on wood supports as illustrated above, with the inside ends of the cores about two and three-fourths in. apart. Fasten the supporting blocks to a wood base measuring about 3-3/4 x 5-3/4 in. Make the shaft from a length of fairly heavy wire. A No. 10 copper wire will do, as it is easily handled. Then bend, near the center, a crank with a throw of about 3/16 in. Bearings consist of holes drilled in the two flat strips of copper or brass which serve as the uprights. The lower ends of these uprights are bent at right angles so that the shaft is on a line with the magnet centers. Insert the crankshaft, slipping the connecting rods over it until they rest in the kink or crank, and then attach the flywheel. This, can be almost any kind of a wheel, such as the pulley wheel. It should be about 2-1/4 in. in diameter. A convenient way- of fastening it on is to drive a wood plug into the wheel hole, drill a small hole in the plug to receive the shaft, and force the wheel into place. You can flatten the shaft a little to prevent slipping. On the opposite end of the shaft mount, with solder, a nut or washer to apt as a spacer, and over this place a lug that projects out one fourth inch or so, as shown in the above photo. The position of this lug is important. When the crank is at its highest point, the lug should project to the right if the engine is to run clockwise, when viewed from the brush end of the shaft. If it is to run the other way, point the lug to the left. The two brushes are merely strips of spring brass, copper, or phosphor bronze mounted on the wood base, and not touching any other metal part. In wiring up the motor connect one wire from each magnet to one of the power wires, and each of the other magnet leads to one of the brushes. The remaining power wire goes to the upright that supports the crankshaft at the brush end; Do not oil the bearing in this upright, as this will tend to cause sparking and faulty contact. This engine design can be modified to include any number of cylinders. I have one of these that I dug out of my high school physics teacher’s back room. No one knew just how old it was or where it had originally come from. It’s temperamental as all get out, but if you hook it to a 9v battery and constantly adjust the throttle, it’ll run pretty well. Really cool to watch and useful for explaining some basic circuitry.